I’ve always wanted to learn to play the piano and to read music. I haven’t, yet, but I will. My mother was in her thirties, late in college, when she finally took a music course. One of our daughter’s took piano lessons for several months, when she was 6 years old, and even had a recital. The private lessons were reasonable, but still cost a bit. It also took some time to drive to the lesson, wait during the lesson, and drive back home. The more children we chose to have, the less feasible private lessons became. KinderBach is the perfect answer for my young ones. 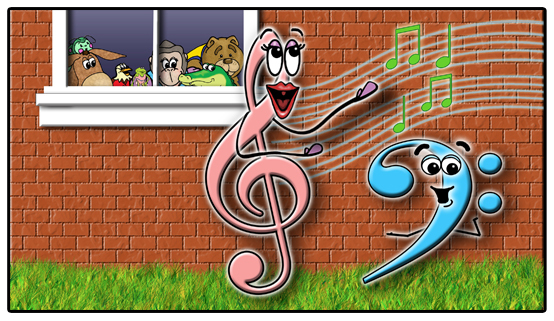 Karri Gregor is the author, illustrator and music educator of KinderBach. “Necessity is the mother of invention.” Karri wanted a music program for her young children and no one wanted to enroll them because they weren’t reading, yet. As many homeschool parents would say, “the best thing to do is teach them yourself.” She had the background; so, it wasn’t a far stretch for her to do just that. Personally, I’m already stretching in other areas; so, I’m grateful she used her talents to put KinderBach together. 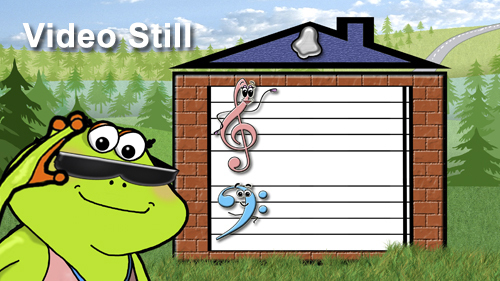 Karri Gregor firmly believes that children do not have to be able to read to learn piano. 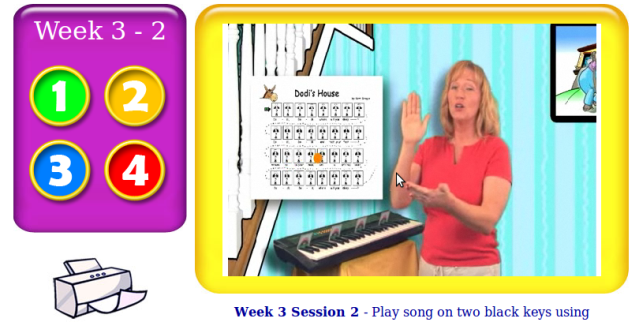 She teaches the notes on the piano and staff by characters rather than letters. Bright, colorful, fun and engaging lessons. 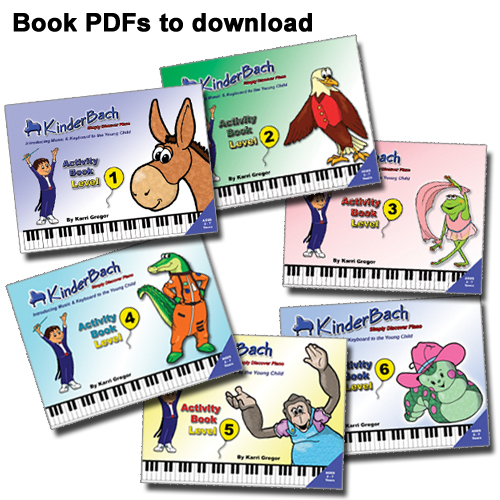 More than piano, 3 – 7 years old are given a foundation in music with KinderBach. There are 6 levels (the 7th will soon be available) – 10 lessons each, 4 sessions in each lesson. The Year Online Membership includes all of the web lessons, with 240 sessions, and downloaded PDF files of coordinating activity pages. KinderBach has a No-Hassle Return Policy for DVDs & CDs as well as a satisfaction goal for web members. There are no bad decisions with KinderBach. All Products carry a 30 day Money Back Guarantee. In addition, all of the disks have a lifetime replacement should any be damaged or broken for any reason. KinderBach wants you to be totally delighted with their product. Click on the graphic (above) and it will take you to a full Curriculum Syllabus by Level and a quick click on the graphic (below) will give you FREE online lessons! 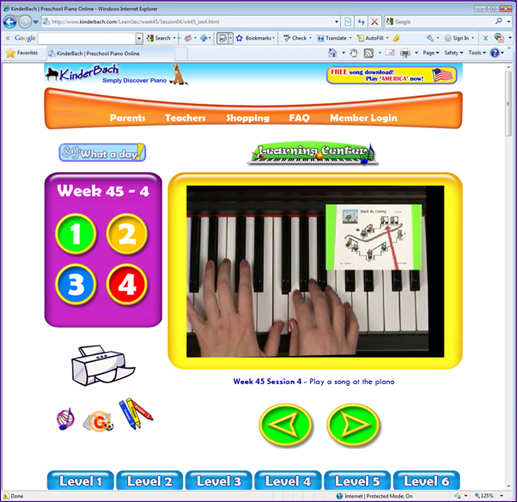 Please, take the time to follow the links I’ve provided, as KinderBach has an excellent web site and there’s so much information to share with you. You won’t be disappointed. 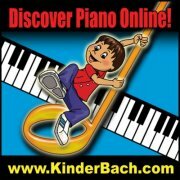 It was a joy to use KinderBach for this review. A big plus for my “littles” is the fact that you can use KinderBach Online with your Wii, if you have one. This made it so much easier for all of mine to see and do at the same time. We don’t have a big TV, but it’s a whole lot bigger than our PC monitor!